A run not for the faint-hearted. For most people running just one marathon is enough, but Dr Khaled Al Suwaidi is taking his powers of endurance to new levels all in the fight against cancer. On Saturday, Al Suwaidi is due to set off on an incredible 327km ‘The Rahma Run’ attempt – roughly the equivalent of running nearly eight marathons back to back. He will kick-off his ultra run from Fujairah Terminals and end at Zayed Port – a logistics partner of the event – in Abu Dhabi. The gruelling challenge will help raise funds for Cancer Patient Care Society – Rahma and the 34-year-old is expected to complete it in around 60-80 hours, meaning he will finish either on Monday or Tuesday next week. Despite scaling the UAE’s 1,200m high Jebel Hafeet mountain up and down in one day last month, becoming the first Emirati to do so, he has never previously run a marathon but has taken on the challenge to raise awareness of how important it is to lead a healthy lifestyle. Indeed, three years ago, he weighed 125kg and was told by doctors he was likely to become a diabetic in the future. But the executive director at Emirates Center for Strategic Studies and Research managed to turn his life around. “I can’t wait to get started. All of my training has been leading up to this moment and I just want to get out there and start running,” he said ahead of the challenge. Dr. Khaled will be accompanied by his coach, a physiotherapist, a paramedic and chef, who will travel in an RV on the route and have the additional support of two safety cars. 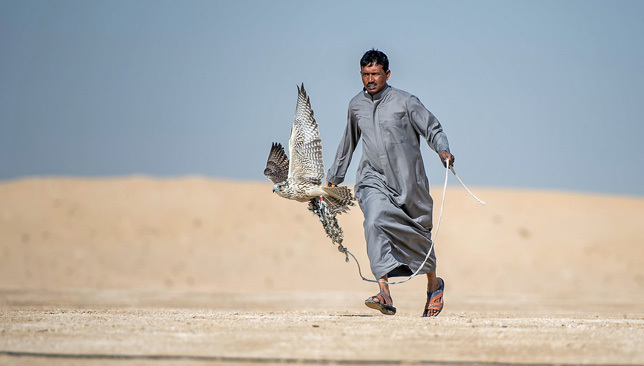 Team F3-K headed by top Emirati falconer Khalifa Bin Mijren ruled the roost on the first day of the Fazza Championship for Falconry – Telwah in Dubai Tuesday. Organised and supervised by the Hamdan Bin Mohammed Heritage Centre (HHC), F3-K clocked the fastest times in all three disciplines (Trophy, Car and Cash) of the Jeer Shaheen Farkh event in the Sheikhs category to kick-off the event in style. Al Dhafra Falcons team and YLS shared the honours in the Jeer Shaheen Jernas event in the Sheikhs category. 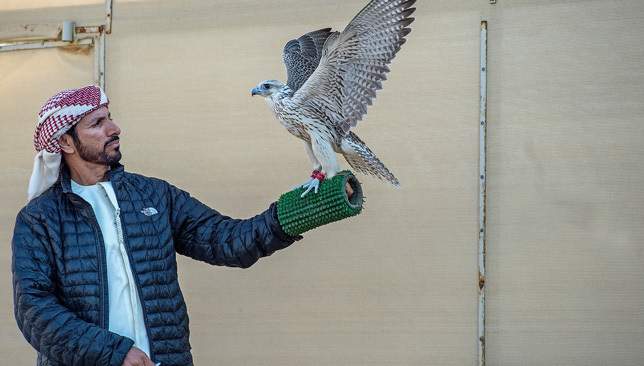 The first day of competition under the new format in which every event is a final saw the participation of more than 180 falcons of the highest quality. Team F3-K began the Trophy event in style clocking the day’s fastest time of 17.824 seconds setting the pace in brilliant sunshine with its maiden entry. Al Dhafra Falcons team were in the running for second place after their entry clocked 17.891 seconds, but were upstaged by another F3-K team entry which clocked 17.833, just 0.009 seconds off the winner’s pace. In an ominous sign of what to expect during the next fortnight, Khalifa Bin Mijrin said the falcons were not so fast because it is the first race of the season. “Some of the falcons are just warming up. It is a new season. They can go faster than this. However, there will be tough competition in every race with fractions of seconds separating the winners as seen in this race,” said Khalifa Bin Mijrin after winning the opening event. In the Cars category, a keen tussle for supremacy was witnessed between F3-K and Al Dhafra Falcons. F3-K entry 81Madrid soared to victory in the Jeer Shaheen Farkh (Cars) in the Sheikhs category clocking the best time of 18.183 seconds after another F3-K entry set the pace clocking 18.504. Al Dhafra Falcons team had the satisfaction of grabbing second place when their entry clocked 18.213, just .030 seconds off the winner’s pace. Team F3-K swept the first three places Jeer Shaheen Farkh (Cash) event in the Sheikhs category. F3-K were finally upstaged by YLS team in the Jeer Shaheen Jernas (Trophy) event in the Sheikhs category, winning the race in 17.508 seconds. Ms. Suad Ibrahim Darwish, Director of Championships at HHC, said the change in the tournament format has produced a high standard of competition and more professionalism. 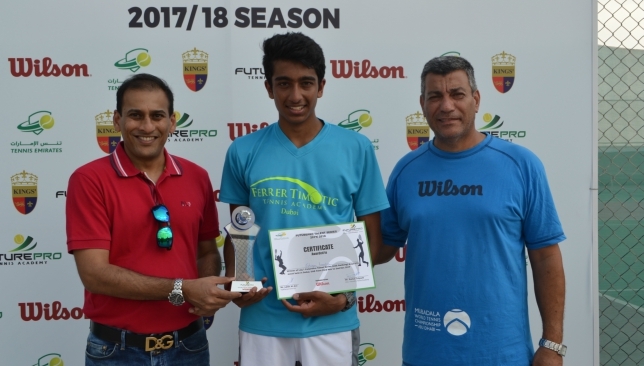 Eshaan Lumba won the Boys U18 final in the FuturePro Series. 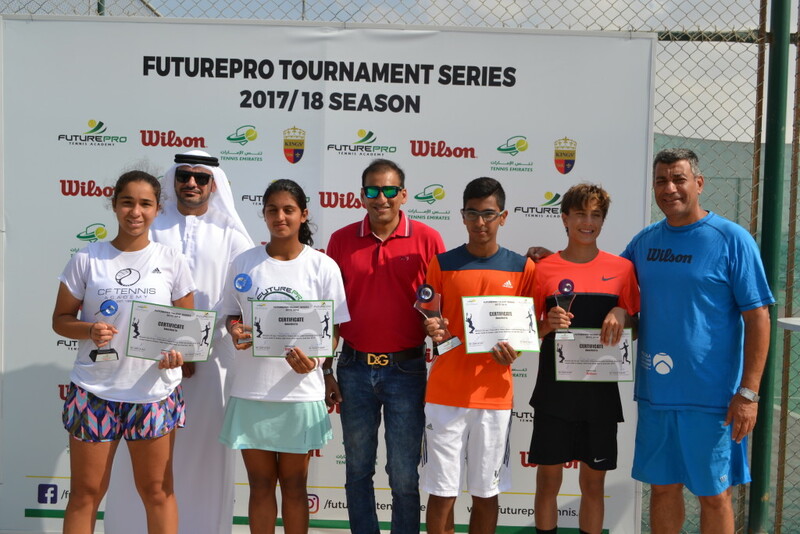 Eshaan Lumba and Vipasha Mehra were crowned the Under-18 boys’ and girls’ champions in the opening leg of the ongoing FuturePro Talent Series. The boys’ Under-16 tournament was also held over the UAE National Day weekend, and it was Garv Bahl who emerged champion. Held at the Kings School Al Barsha tennis courts and part of the newly-formed UAE National Ranking Tennis Tournaments of the UAE Tennis Federation, theFuturePro Talent Series has proved to be a huge success with nearly 110 budding stars taking part in the five age category events that have taken place so far. The tournament, which is being hosted by the FuturePro Tennis Academy, one of the fastest growing academies in the UAE, continues this week with the men’s, women’s and veterans’ tournament. In the boys’ Under-18 final, the tall Lumba prevailed over a spirited Karan Manghnani. The 15-year-old from Dubai American Academy did not drop a single set in his four matches, but after taking the first set 6-1, was stretched in the second before winning 7-5. “I really enjoyed playing the tournament and it is a great initiative from the UAE Tennis Federation. I have been in Dubai for the past three years and it was getting a bit frustrating not to be able to play regular tournament tennis. But with the UAE National Ranking Tournaments, that issue has been addressed,” said Lumba. Mehra, an ITF-ranked player who trains at FuturePro, was equally impressive in her victory. The 15-year-old southpaw was a 6-2, 6-3 winner over Russia’s Rosaleen Alioussef in the title decider. Her only worry during the week when she won all her matches in straight sets was a first-set tiebreak against the girls’ Under-14 champion Stefania Bojica in the second round. The finalists of the U18 boys and girls divisions pose with their trophies. In the boys’ U-16 finals, Bahl was a 6-3, 6-0 winner over the U-14 champion Elias Anwar. FuturePro will be hosting five legs of National Ranking Tournaments until May 2018 as part of the official UAE National Tennis Calendar. Rahul Tulpule, co-Founder & CEO of FuturePro Tennis Academies, which also has presence in India and Argentina, said: “It really has been a fantastic response to our tournament and it is great to get the feedback from the players and their parents so far. FuturePro is working very closely with UAE Tennis Federation and has taken up the maximum slots in the UAE Ranking Tournament Calender for the 2017-18 season. With an objective to encourage adults to take up the game and enjoy it as a recreational and fitness activity, the Academy has also launched the FuturePro Amateur Series for beginners and intermediate players. All details and entry forms of the tournaments can be accessed at www.futureprotennis.ae.